When the Pittsburgh based arm of Comcast asked us to put in a bid to shoot a PSA (Public Service Announcement) for them, we knew we would be up against much bigger city production studios. The ad had to do with safe driving practices, and the script called for a split screen of a young female driver doing all sorts of things that illustrate distracted driving, while the other side portrayed the same driver practicing safe driving techniques. Our immediate thought was that the Pittsburgh production companies would likely choose to shoot this live on an actual city street, requiring tons of equipment, a full crew, and permits to close down a street. We also knew that we could do this without all those extra costs and logistics problems….and shoot the entire ad in a few hours in our own studio on the green screen. After explaining this to Comcast and sending a few samples, we were awarded the project. Then, with our intern and her car safely parked just inside the studio’s main bay door, we proceeded to film her doing all kinds of silly things that someone might do while driving…from texting to doing her nails…all without permits, closed courses, scheduling and logistics nightmares, and most importantly, without any safety issues whatsoever. All the backgrounds were added in post, including elements like windshield reflections, to add to the realism. The resulting ad looked just like it was shot live on the road, and was much more budget friendly than doing it for real. All hail the green screen! We’re always thinking to help our clients find the best possible solution. 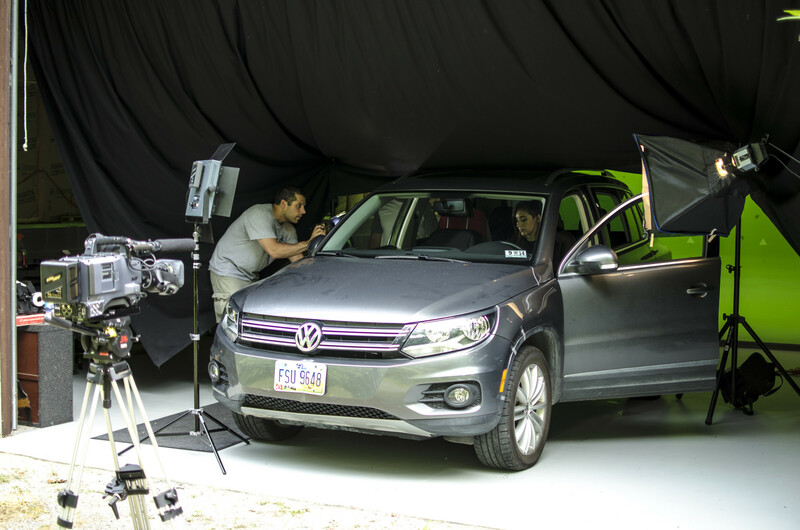 Shooting a safe driving PSA…without all the driving!